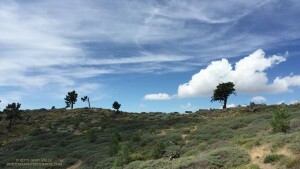 What’s the Current Weather on the AC100 Course? 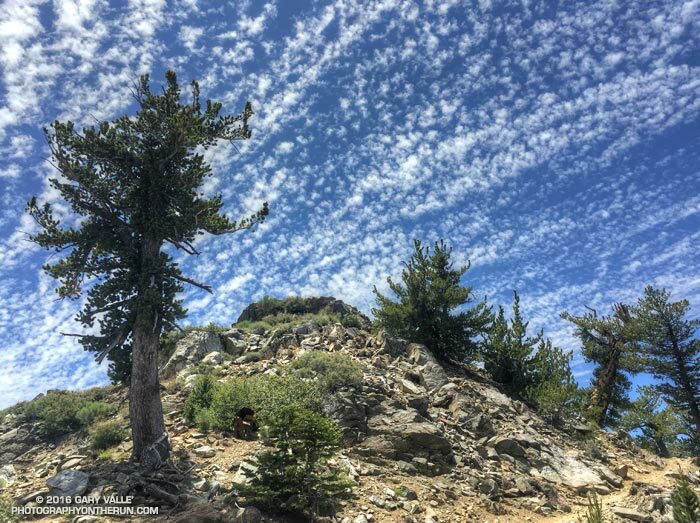 A couple of weekends ago we had cool weather for a 28 mile Angeles Crest 100 training run from Islip Saddle to Chilao Flat. It was a bit windy and chilly at Islip Saddle, but once we were up and over the shoulder of Mt. Williamson the wind settled down and the weather for the remainder of the run was near perfect. This was the second of four supported AC100 training runs, each covering a different section of the course. These organized runs account for just a tiny fraction of the total mileage a runner does to prepare for this event, and much of the mileage is done on the AC100 course. Where is the AC100 course? 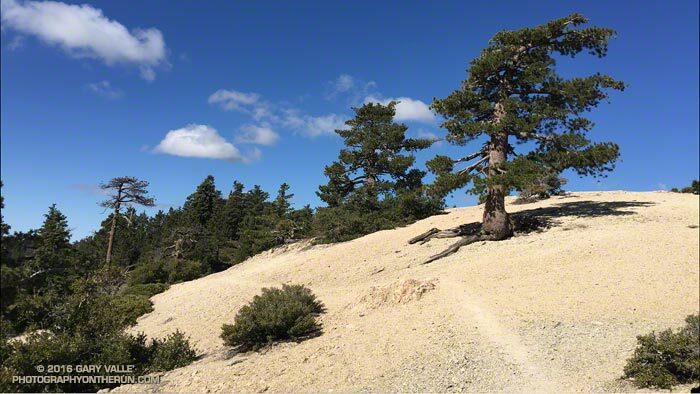 Incorporating segments of iconic trails such as the Pacific Crest Trail, Silver Moccasin Trail and Gabrielino Trail, the AC100 starts in the mountain community of Wrightwood, California and ends in Altadena near JPL, traversing a large part of the San Gabriel Mountains. 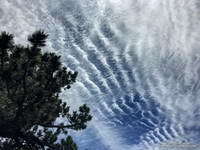 Mountain weather — even Los Angeles County mountain weather — can be extremely varied and changeable. 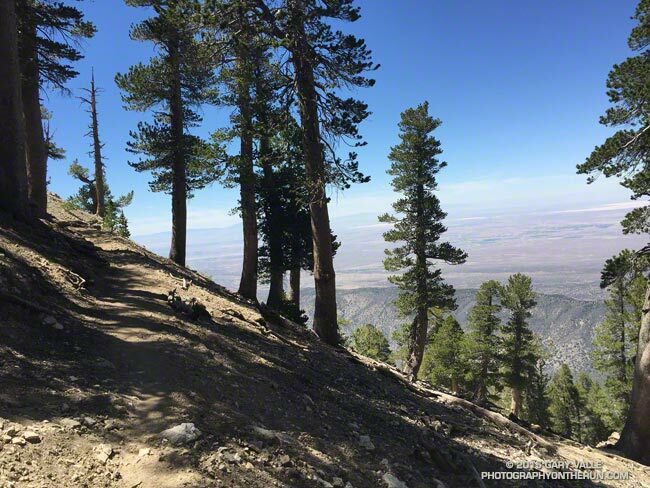 At about mile 18 the AC100 course reaches an elevation of more than 9,200′, near the summit of Mt. Baden-Powell. On the same day temperatures on the course can differ by 50 degrees or more. One section can be inundated by a flash flood while another is bone dry. During a Spring training run it might be 100 in the sun at Echo Mountain, while it is snowing on Baden-Powell. The Mt. Wilson Towercam is usually pointed in the direction of the Angeles high country. When it is, it provides a great overview of about two-thirds of the AC100 course. The view extends from the top of the Acorn Trail at about mile 4 (in the distance on the far right), along the crest past Mt. Baden-Powell, Throop Peak, Twin Peaks and Waterman Mountain to Three Points at about mile 43. Chilao is hidden from view, but the Charlton Flat area and a section of Edison Road is visible on the left. Newcomb Saddle, at about mile 68, is on the lower right. Here’s an annotated Towercam image that shows the approximate location of these features. 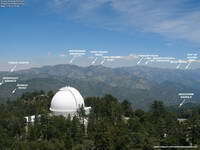 Bill Westphal’s Altadena Weather & Webcam gives a lower elevation view of the San Gabriels, near the AC100 Finish. The view is NE toward the Sunset Ridge Trail and Mt. Lowe Road, around mile 93 or 94. The course goes from the right of the photo to the left, but is mostly hidden from view. If you are willing to jump through some Java security hoops the Mountain Hardware Live Interactive Cam in Wrightwood is a couple blocks from the AC100 Start. 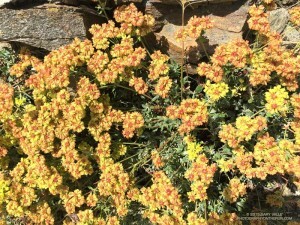 It has views of downtown Wrightwood, Wright Mountain, the Heath Canyon landslide, Blue Ridge and several other locations. I temporarily enabled Java and followed the troubleshooting info linked on the web cam page. I’ve been able to get it to work on a desktop system using Firefox or Internet Explorer. Note that enabling Java and adding non-secure URLs to the Java exceptions list decreases the security of your computer. 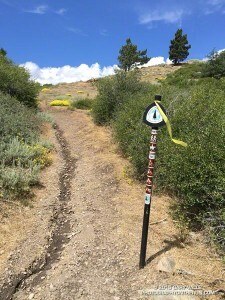 Following are several Remote Automated Weather Stations (RAWS) and Weather Underground Personal Weather Stations (PWS) along or near the AC100 course, in order from Start to Finish. 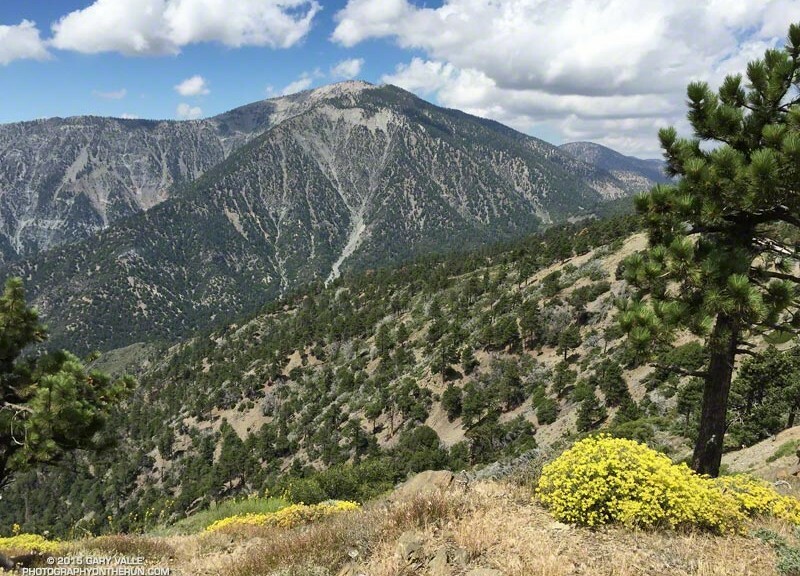 Wrightwood KCAWRIGH7 PWS (5996′) – Approximately 0.25 mile W of Start. Was 55°F at 5 a.m. for 2015 AC100. 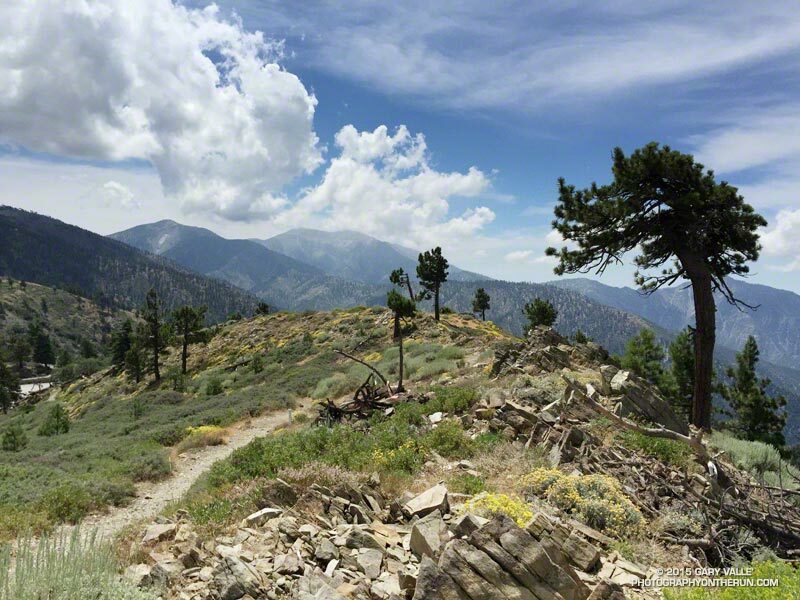 Wrightwood KCAWRIGH9 PWS (6000′) – Approximately 0.6 mile SE of Start. Was 59°F at 5 a.m. for 2015 AC100. 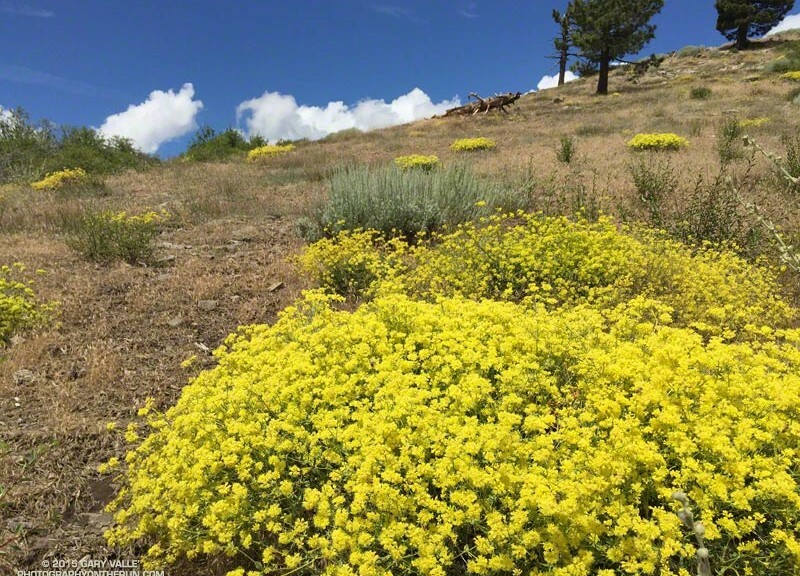 Big Pines BPNC1 RAWS (6964′) – Off Hwy 2 near Mountain High Ski Area. Top of Mt. Baden-Powell can be 12+ degrees cooler and much more windy. Was 64°F at 6:54 a.m. for 2015 AC100. Fuel temp at 11:54 a.m. was 92°F. Mountain High Ski Area Base & Top Conditions – Approximate elevation of Base is 7000′ and top is 8000′. Compare Base temp to Big Pines temp. Chilao CHOC1 RAWS (5450′) – Approximately 1.25 miles WNW of Chilao aid. Fuel temp at 1:53 pm was 95°F for 2015 AC100. Air temp at 6:53 pm was 79°F. Clear Creek CEKC1 RAWS (3000′) – Approximately 6.8 miles W of Shortcut Aid (~4793′) and 2.9 miles W of Red Box Aid (~4620′). Was 71°F at 8:54 p.m. for 2015 AC100. Mt. Wilson MWSC1 (5710′) – Approximately 1.5 miles NW of and 780′ above the top of Mt. Wilson Toll Road (~4930′). Compare to JPL 5600′. Was 69°F at midnight for 2015 AC100. Henninger Flats HNGC1 RAWS (2800′) – Approximately 0.8 miles WSW of Idlehour Aid (~3168′). Marine layer can increase humidity on this section of the course. Was 69-70°F from 4 a.m. to 7 a.m. for 2015 AC100. Fuel temp was 89°F by 11a.m. Altadena KCAALTAD18 PWS (1214′) – Approximately 0.6 miles S of Finish. For 2015 AC100 temp ranged from 66°F at 2 a.m. to 63°F at sunrise. Temp was 79°F at 9 a.m., 82°F at 11 a.m., and 86°F at 1 p.m. Humidity was high with dew point about 70°F. Altadena KCAALTAD41 PWS (1348′) – Approximately 0.4 miles NW of Finish. It’s not on the AC100 course, but the Mt. Baldy Ski Lifts Web Cams and Weather can be useful for estimating mountain temps and for Baldy area training runs. The weather conditions are for the Notch at 7800′. Updated June 29, 2018. Elevation profile updated to 2017 AC100. Switchback after mind-numbing switchback you work up the mountain. White firs and sugar pines give way to lodgepole pines and then the forest begins to thin. Views of the high desert stretch out to Edwards Dry Lake and the Southern Sierra looms hazily in the distance. 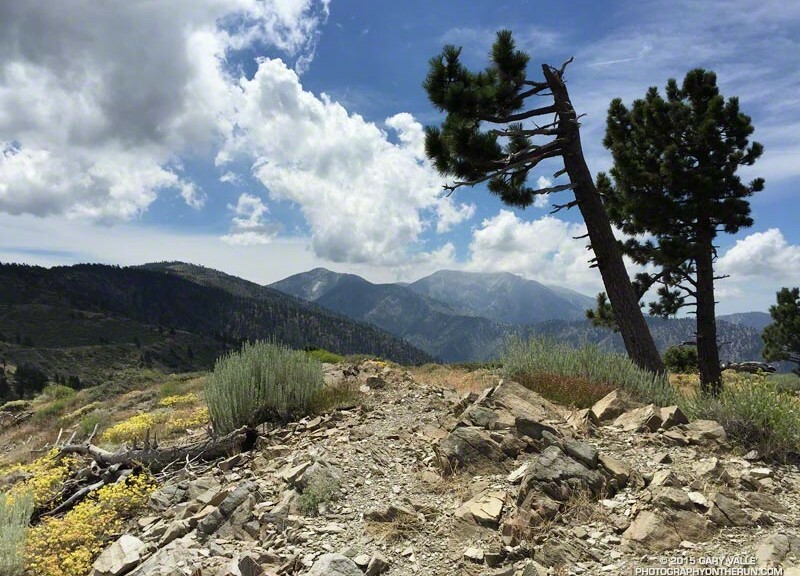 This mountain, Baden-Powell, is the second of several big climbs on the Angeles Crest 100 Mile course. 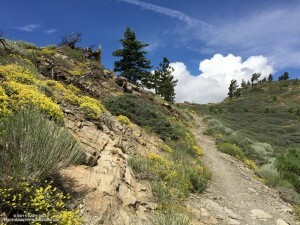 While it reaches the highest elevation on the course — about 9250′ — it is not the longest climb or the ascent with the most elevation gain. Which climb on the course is the most difficult is an all together different question, and one that can only be answered on race day. This elevation profile of the 2017 AC100 course (PDF) was created in SportTracks from a runner’s GPX track. The profile uses elevations corrected with pkan’s Elevation Correction Plugin and NED 1/3 arc second DEMs and a conservative elevation data smoothing setting. 2017 Angeles Crest 100 Mile Elevation Profile. Click for PDF. The mileage is from the GPX track and is the calculated distance over the terrain, including any extra wanderings of the runner at aid stations and on the course. Placemark locations, mileages, and elevation gains and losses are approximate. Using the smoothed, corrected elevations, the cumulative elevation gain on the AC100 course worked out to around 18,520′ and the loss to around 23,215′. These are conservative values. The gain and loss could easily be a bit more.